True wireless vs wireless: what’s the difference? True Wireless headphones – those that you see in this guide – have no cord whatsoever. While wireless allows us to wear headphones a few feet away from our music players, True Wireless cuts the cord between the earbuds, giving us true freedom. Wireless headphones have existed for some time now, basically since Bluetooth as a standard was invented. Though battery powered and not physically connected to your phone, they have a cord connecting both buds – and sometimes a band around the neck too. If you don’t want to drop the cables completely, check our best wireless earbuds guide. Wires have their faults – they get tangled, get caught, and slap your neck while working out. That might be why you’re looking for the best true wireless earbuds around, and we’re here to help. The days of wireless earbuds offering sound quality and design that’s inferior to their wired counterparts are how firmly behind us, and you can now get a serious audio experience on the go without any wires. The latest true wireless earbuds not only sound just as good as their wired equivalents, but they’ve become just as reliable thanks to major improvements in Bluetooth 4.0 and other wireless technologies. True wireless headphones may be a bit more expensive, sure, but that additional upfront cost pays for the convenience of living cable-free. If you’re ready to take the jump, read on for our picks. Apple AirPods have popularised the true-wireless format. They work seamlessly with an iPhone, sound good in terms of their form factor, and have excellent connectivity and battery life. Other headphones allow you to control your music more quickly, and more easily. Siri is no match for a dedicated in-line remote (and isn’t the best of voice helpers), and it feels counter-productive having to constantly take your phone out of your pocket to control music. If you only have the budget for one of these, go for the Elite 65t. If you’re more the athletic type, the Jabra Elite Sport are currently the ultimate true wireless earphones for runners and other kinds of athletes. There’s a heart rate sensor on the right earpiece, letting it monitor your exertion level as you exercise. 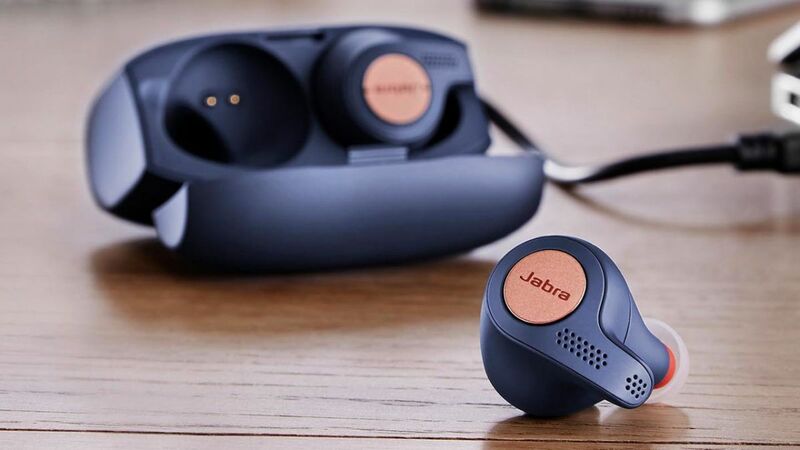 A Jabra companion app lets you track your exercise, and you can kick off a workout by pressing a button on one earpiece, and the heart rate tracker is more reliable than most wrist-worn models… as long as you fit the Elite Sport buds properly. The Jabra Elite Sport don’t perch in your ears, they fill them rather like a custom molded earphone. As a result, sound isolation is excellent and the fit is very secure. To sweeten the deal, Jabra recently updated the Elite Sport to boost stamina to a better-than-average four-and-a-half hours per charge – more than enough to get you through your weekly workouts – before hanging up the towel. The NuForce BE Free5 wireless earbuds show just how accessible truly wireless headphones are today. For around $100 (about £75, AU$134) they feature a more polished design than the more expensive BE Free8, and even sound better to boot. However, we found the left earbud would drop out briefly more than we’d like, and we hope NuForce can address this issue. The connection dropouts combined with the frustrating controls keep it from claiming the top spot on our list, but the BE Free5 offer undeniable value in the truly wireless headphone market. Sony’s first pair of true wireless headphones, the Sony WF-1000X, were divisive. Some thought they didn’t offer enough bass. Others said they had too much. Some said they cut out or unpaired periodically. Others simply never had that problem. Criticisms came hard and fast from all corners of the internet and the only reasonable conclusion one could make after sifting through all of the noise was that Sony’s headphones just couldn’t please everyone. Nothing about the Optoma NuForce BE Free8 stands out but that’s actually a good thing. Its understated design flies under the radar, sound quality is good and battery life is excellent. A single charge will yield four hours of music playback, but the changing case can charge the earbuds three times, giving a total of 16 hours of playback before the headphones and case need charging. Sound quality is slightly warm and soft, but works well for a variety of music. Audiophiles won’t be pleased but for most people, the NuForce BE Free8 will do the job. Its excellent noise isolation also make these great for commuters. For the money, the Optoma NuForce BE Free8 are an excellent value in the truly wireless headphone segment. These headphones do the basics so well they’re easy to recommend for those who want to try truly wireless earbuds. Considering it’s still rare to get noise-cancellation in wired earbuds at all, the fact that Sony has managed to pack it into a pair that are not only wireless, but true wireless is very impressive indeed. The Sony WF-1000X manage to offer a level of noise-cancellation that’s very good for a pair of earbuds – it won’t offer the same isolation as a pair of over-ear cans, but if you’re after a sleek form factor then the compromise is worth it. Beyond the noise-cancellation the earbuds continue to impress. Battery life is an acceptable three hours (acceptable for true wireless that is), with a further six provided by the charging case, and sound quality is rich and full. Our only real reservation with the headphones is an occasional spotty connection between the two earbuds themselves (which rarely lasts for as much as a full second), and a lack of volume controls on the earbuds themselves (instead your options are limited to playing, pausing, and skipping your music). Still, if you’re after noise-cancellation and decent sound quality with your earbuds, then the WF-1000X are the way to go. At $299 (£259, AU$449, AED 1,199) you can throw in a bit more cash and splurge for one of our favorite noise-cancelling headphones, the Bose QuietComfort 35 $349 (£259, AU$499, AED 1,449), which give you better battery life and a richer sound. But if you’re looking for a something to take to the gym and have the cash to burn, then the Beoplay E8 might be just what you’re looking for. While you won’t find noise-cancellation here, you will find a longer-lasting battery life of around four hours alongside Bluetooth 4.2. The E8 come with a stylish carrying case, and you can tweak the sound to your liking using the accompanying Beoplay app on Android and iOS.